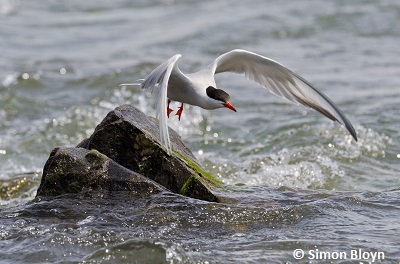 These seabirds are found year-round off the Atlantic and Pacific coasts of Canada. The Common Murre is generally present in waters that are free of ice, whereas the Thick-billed Murre lives almost year-round in colder areas where there is at least some floating pack ice. Murres are not very good fliers or walkers. 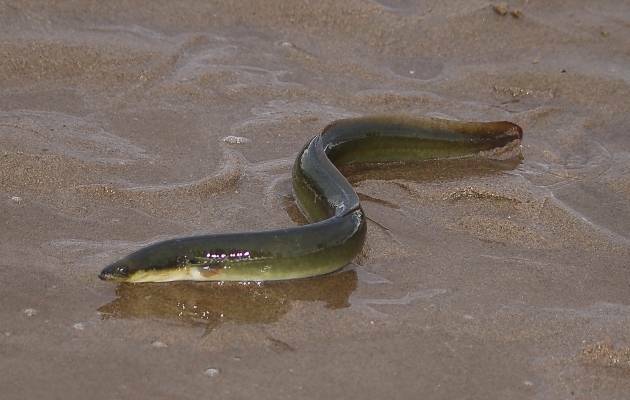 Their wings are smaller than those of any other flying bird of their size, and they have to flap very fast to take off, taxiing across the surface of the water and often bouncing off the tops of waves before getting airborne. 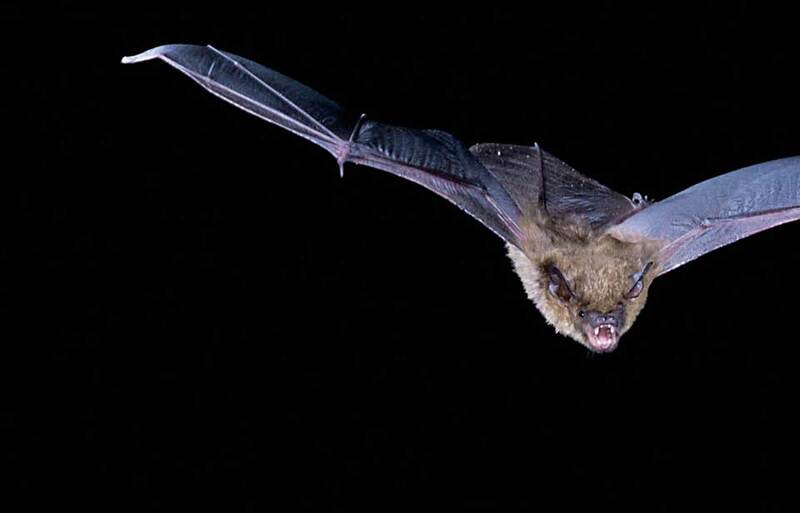 However, they are fast fliers once in the air, where they travel at about 75 km per hour. Because their tails are very short, murres use their feet as rudders for flying, spreading them apart for complicated manoeuvres. Murres cannot turn sharply and may have difficulty landing at their rocky breeding colonies on stormy days, sometimes bumping into a cliff and circling back to make several attempts before successfully landing on a ledge. 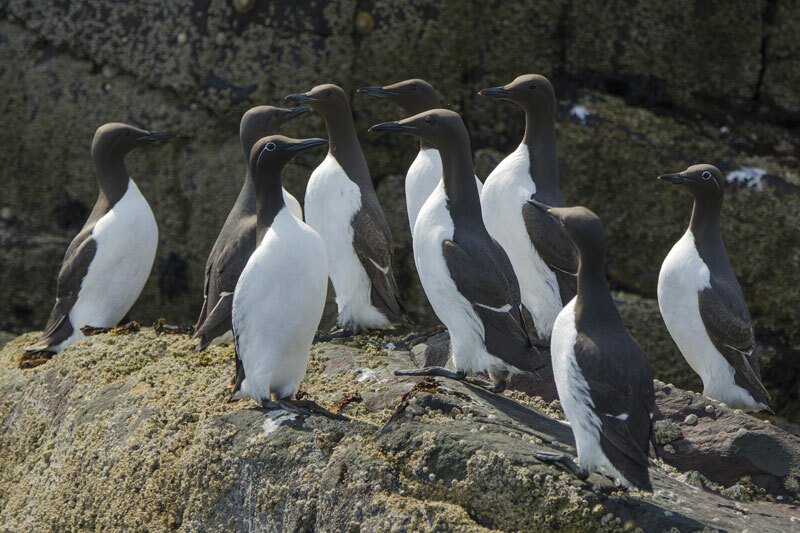 Murres are awkward on land because their feet are placed far back on their bodies. They either shuffle along slowly on their haunches or patter erratically with wings flapping wildly. However, murres do not rely heavily on flying and walking, because they spend eight or nine months of the year continuously at sea, coming ashore only to breed. Swimming and diving are the murres’ specialties. 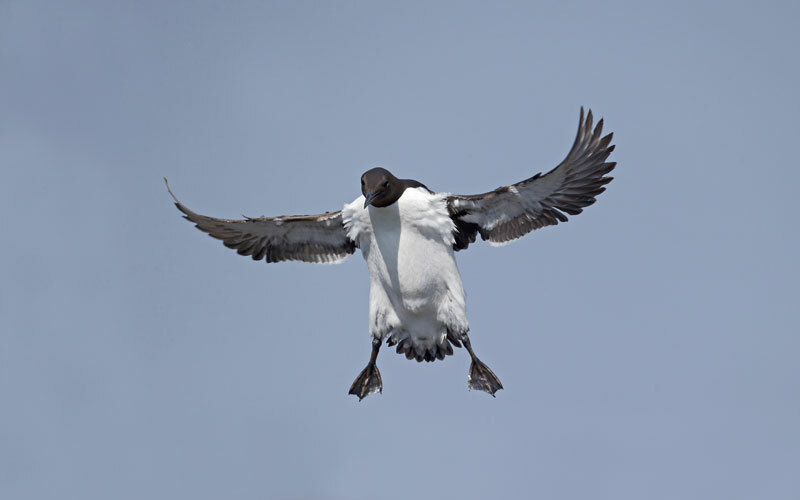 Unlike many ducks, which propel themselves underwater with their feet, murres dive by flapping their half-open wings, as if flying underwater. 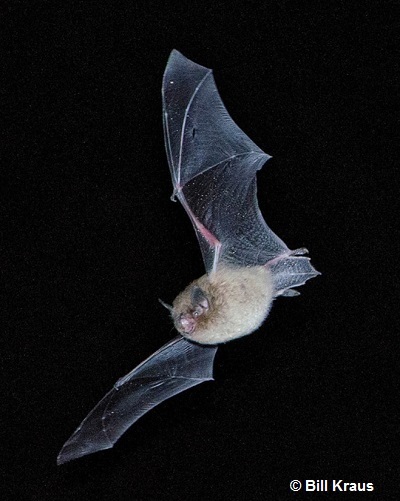 Their wings must be relatively short to do this, because water has much more resistance than air and takes much more effort to move through. 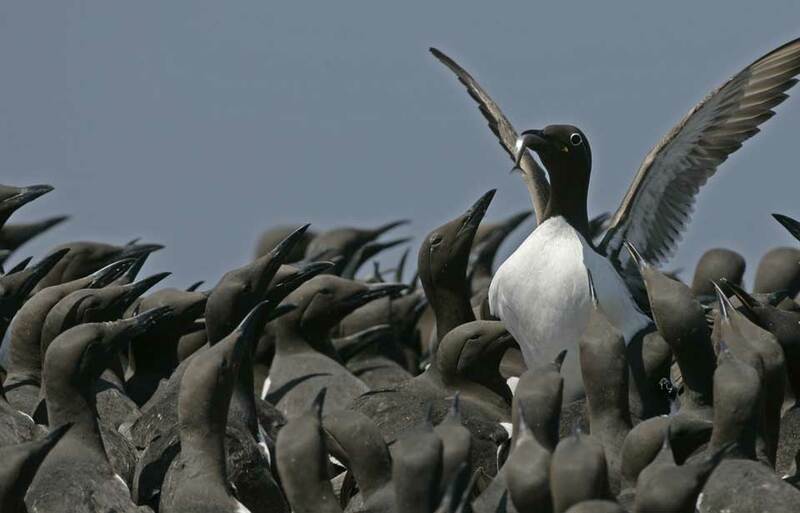 To support all this flapping, murres have very large breast muscles, which make up a quarter of their body weight. 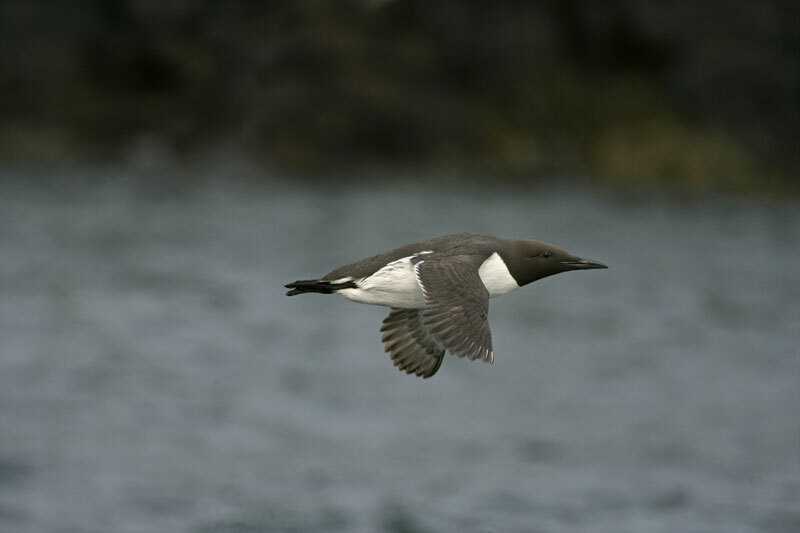 If murres were any larger, their wings would be unable to propel them through both air and water. The extinct Great Auk was much larger than a murre, weighing up to 5 kg, and although its small wings made it a superb diver, like penguins, it was completely flightless. 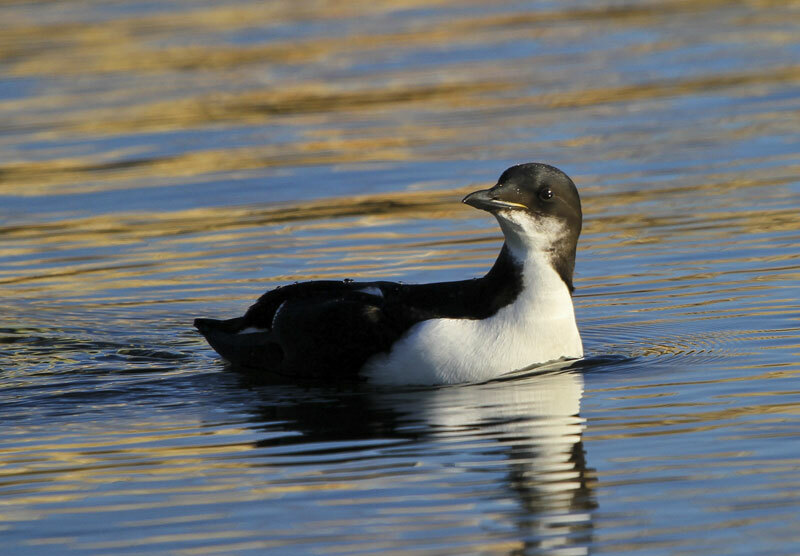 Murres can remain submerged for several minutes at a time. 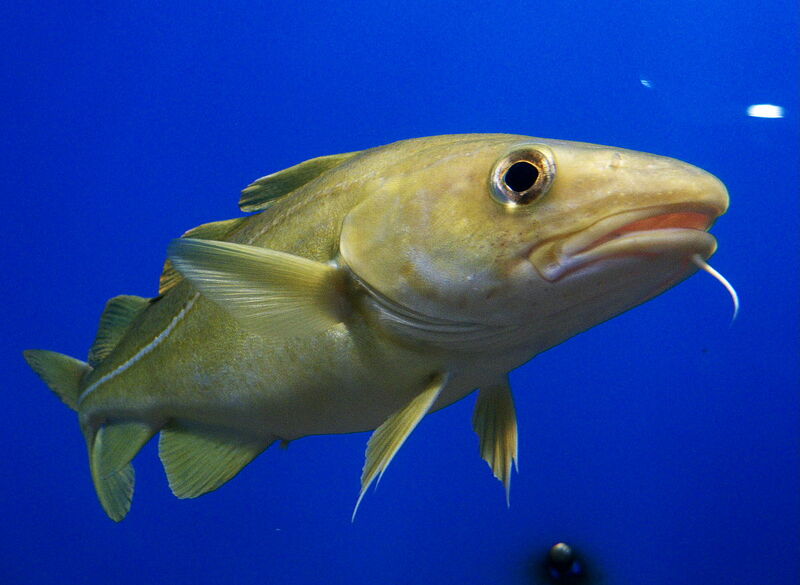 They have been recovered drowned in fishing nets set as deep as 180 m, and dives to 100 m appear to be common. It is amazing to think that a bird can dive to such depths, where the pressure is so great, and find its food in the darkness there. Arctic Thick-billed Murre chicks make a remarkable swimming migration that is unique among birds. When these chicks are about three weeks old, they set out on long migrations from their breeding grounds to the wintering area off the island of Newfoundland. 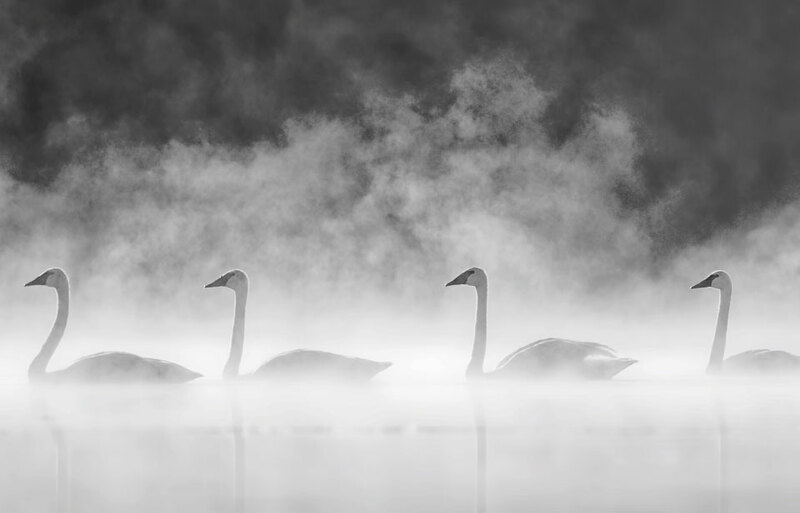 The first part of this journey, perhaps as much as 1 000 km, is made entirely by swimming, because the young birds are unable to fly before they are about one and a half months old. The chicks continue to grow at sea, fed by the male parents travelling with them, which are also flightless much of this time while they moult, or grow new wing feathers. 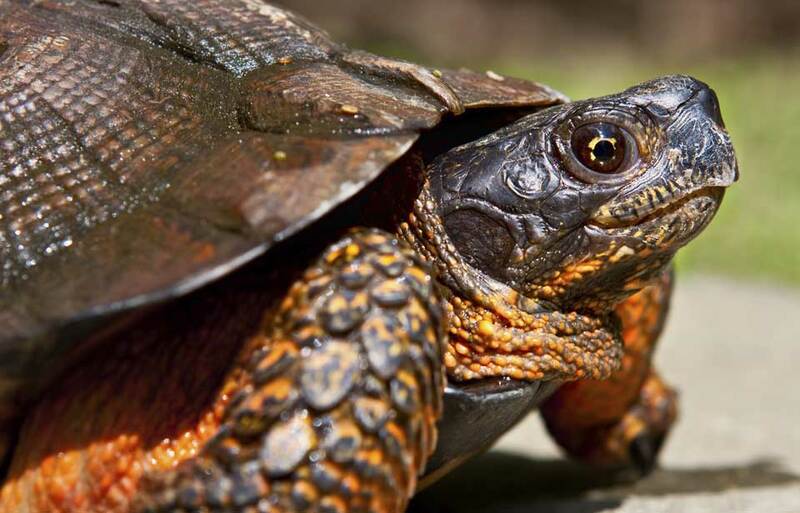 No other species travels so far at such a young age, while still unable to fly. Some Thick-billed Murres found in waters off eastern Canada in winter come from as far away as Greenland, Russia, and Norway, and Common Murres found in British Columbia waters come from Alaska to the north, and Oregon and Washington to the south. The bulk of the Common Murres’ Canadian breeding range is in the Gulf of St. Lawrence in Quebec and along the coasts of Newfoundland and southern Labrador. 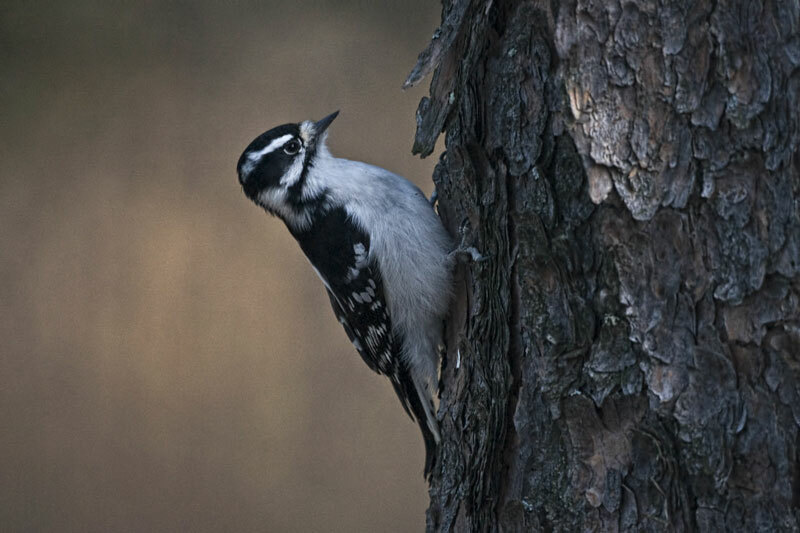 Small numbers nest on islands off the coast of Nova Scotia and in the Bay of Fundy. 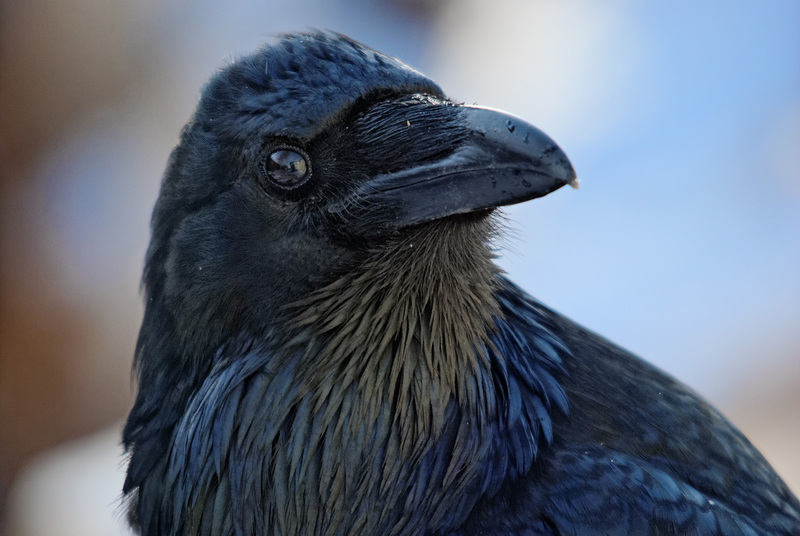 They also breed on coastal islands and headlands from California to Alaska, with several thousand nesting on islands off the coast of British Columbia. 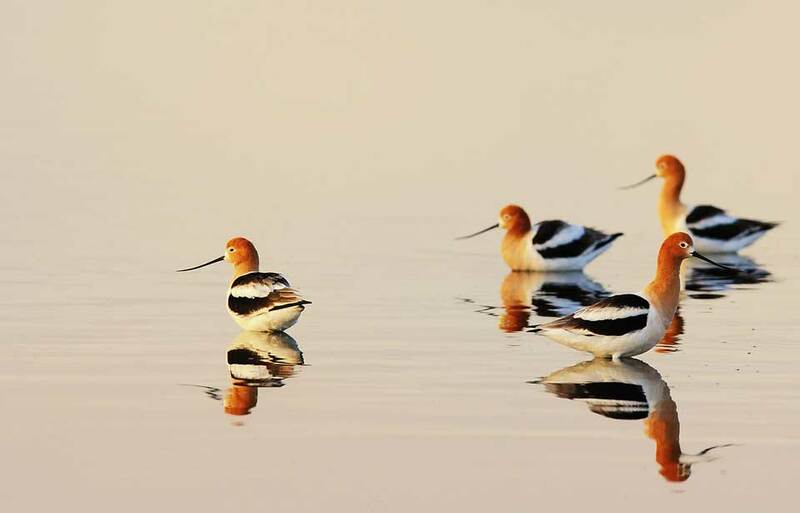 These birds migrate along the coast in the fall to areas where winter food is plentiful, usually within 1 000 km of their colonies. Common Murres first return to their breeding areas in March, and by late April they are establishing nest sites on rocky ledges of the colony. Some Thick-billed Murres breed in small numbers among Common Murres on the Pacific and Atlantic coasts, but most breed in the arctic regions of Canada, Alaska, and Greenland north of the 60th parallel. 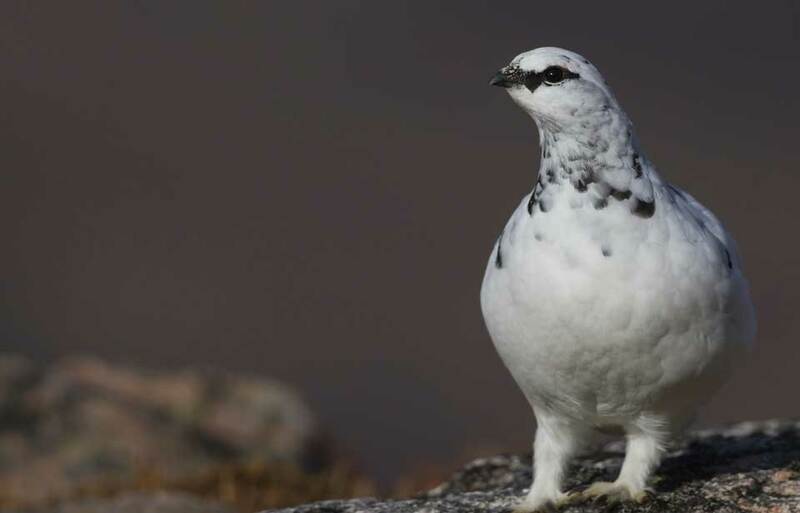 They concentrate in a few huge colonies such as Digges Island in northern Hudson Bay, where about 300 000 pairs nest on sheer 200-m-high cliffs. Thick-billed Murres that breed in west Greenland and the eastern Canadian Arctic leave the colonies in August to move south ahead of the developing pack ice each fall, reaching the water of Newfoundland and Labrador by November. 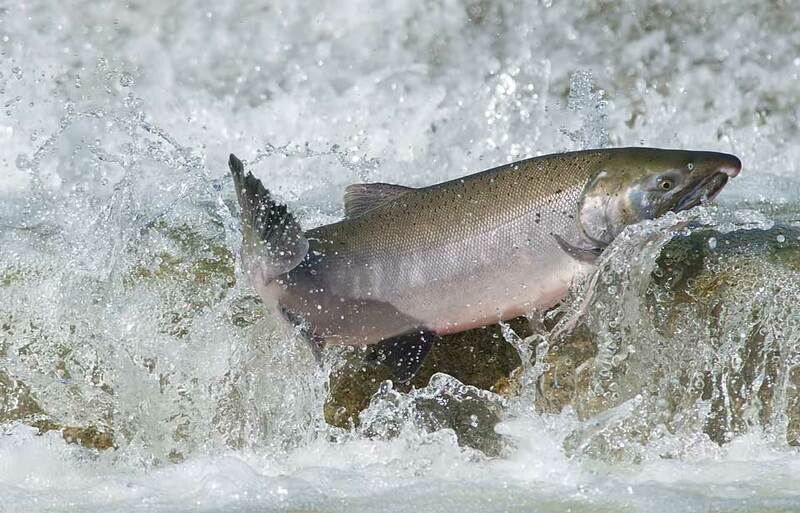 They swim south with the prevailing currents, undergoing a wing moult that makes them flightless for up to a month. They may cover a distance of as much as 6 000 km in three months as they move from the high Arctic to Atlantic Canada. 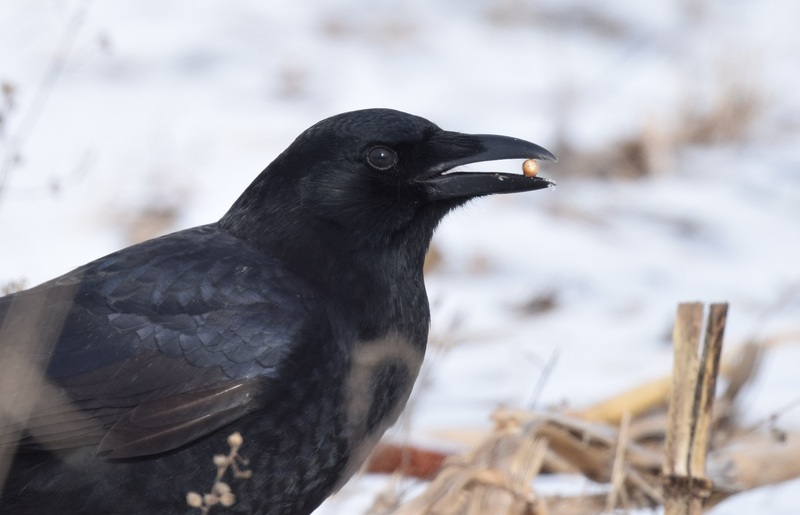 These birds are common in bays around the coast of Newfoundland in winter, except where sea ice covers the surface, and they occur on the Grand Banks as far out to sea as the edge of the continental shelf. Thick-billed Murres along the Atlantic coast return to their nesting areas in April and May, mostly by flying, as the Labrador Current breaks up the pack ice. 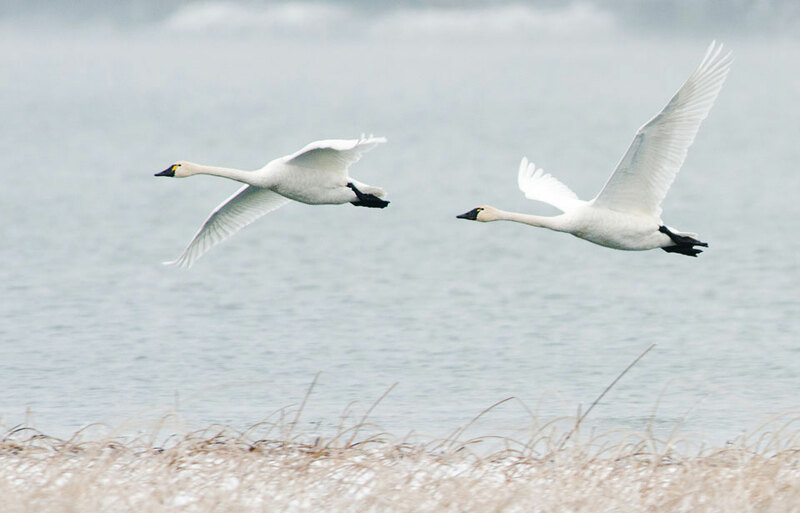 They are back in the colonies by June for the short arctic nesting season. Little is known about the movements of the Thick-billed Murres on the Pacific coast, which number only a couple of hundred birds. The rare individuals that winter off northern British Columbia probably come from Alaskan colonies. 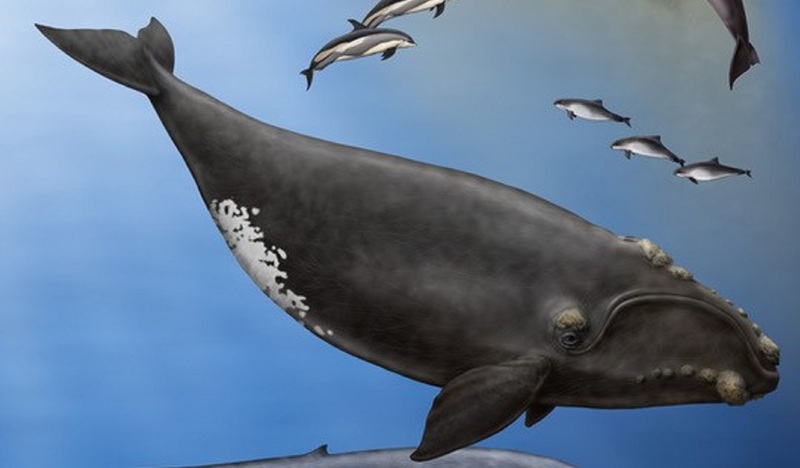 These birds spend almost all their lives at sea and dive beneath the surface to feed on fish, squid, and shrimp-like crustaceans called krill; in fact, they eat almost any marine life up to the size of a 30-g fish. Murres may approach deep-swimming schools of fish from below and attack them as they are silhouetted against the dim light far above. 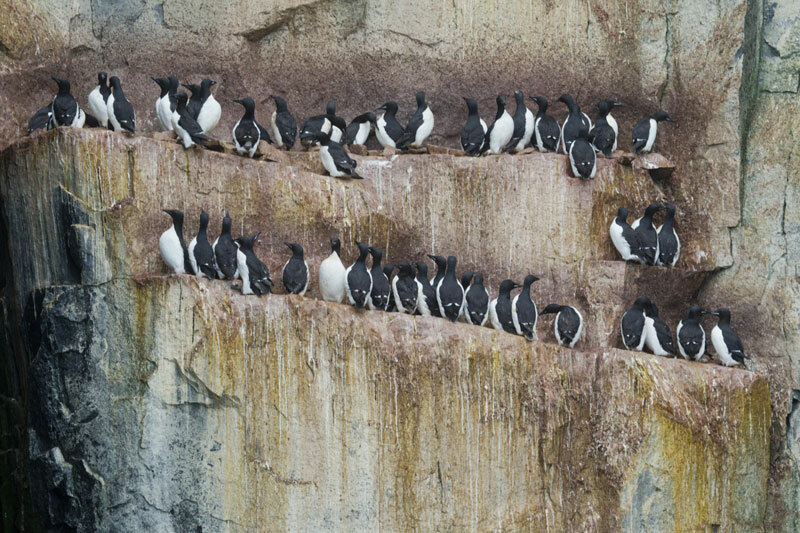 Early in the season, murres visit their colony only occasionally, but as the date of egg laying approaches, at least one member of each pair stays at the breeding site. 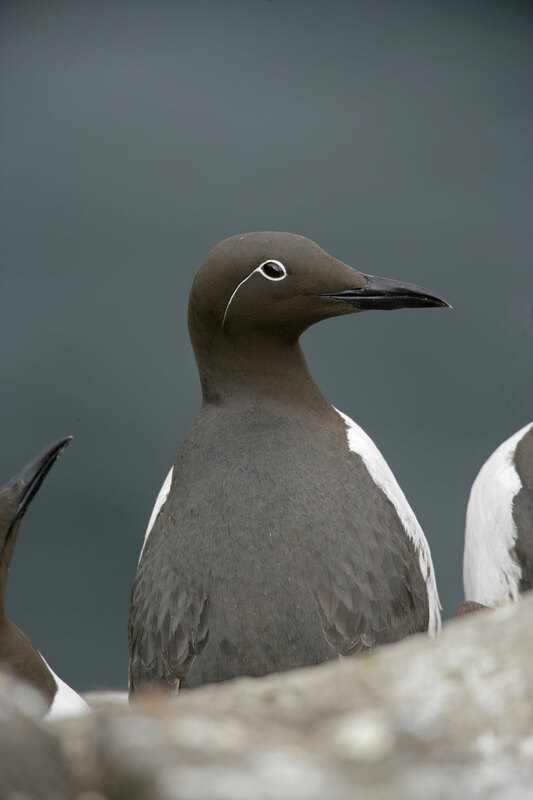 Most murres breed where predators such as foxes cannot reach them—on small ledges on steep coastal cliffs, on steep-sided rocky islets, and, in the case of the Common Murre, on flat rocky islets. Where the two species are found together, Common Murres generally occupy the broader shelves and tops of stacks, whereas Thick-billed Murres are confined to very narrow ledges. 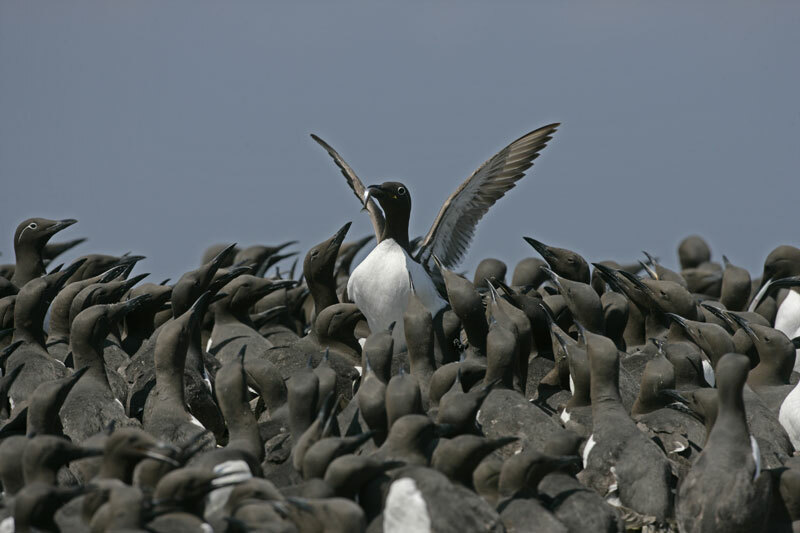 Murres tend to breed in huge colonies, the largest in Canada being on Funk Island, 55 km off the northeast coast of the island of Newfoundland, where about 340 000 pairs of Common Murres congregate in an area of about 1.5 ha, equal to about three football fields. Imagine the noise of adults and their chicks calling and squealing, and the smells of uneaten fish and the droppings of that many birds wafting out from such a colony! Murres of both species only begin to breed successfully at about five years of age and generally lay one egg each breeding season. No nest is constructed, and the egg is laid directly on the rocky ledge. The egg is relatively large, weighing about 100 g, and is incubated, or kept warm, continuously by one of the parents. 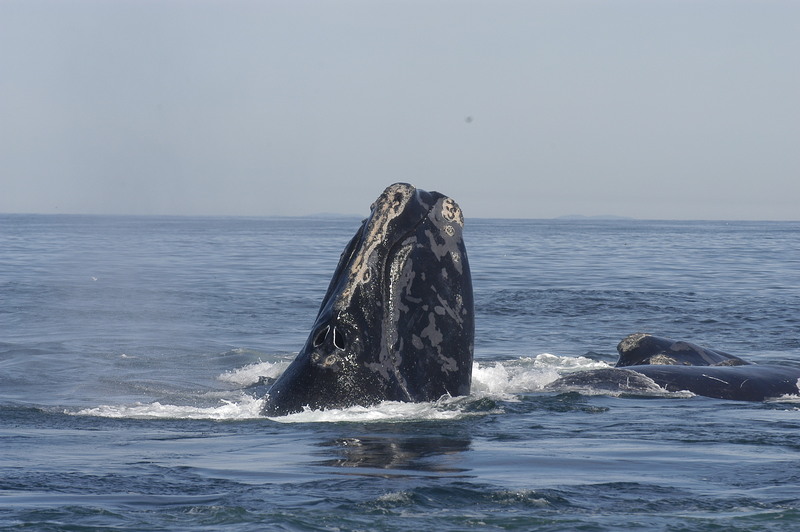 They take equal turns of one or two days sitting while the other parent is feeding at sea. The bird keeps the egg warm by tucking it under its feathers against the bare skin of the “brood patch” on the lower belly. An egg may be dislodged from a narrow ledge, especially if birds are disturbed and fly off in panic, or if gulls or ravens swoop in to steal the egg. When an egg is lost, a second may be laid after about two weeks. 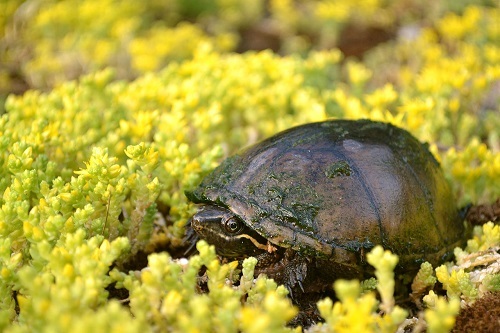 Occasionally, if two eggs are lost in quick succession, a third may be laid, but this is the most the female is able to produce in one season. A chick hatched from a late egg may not have time to grow to fledging, when it leaves the colony, before the short summer ends. The chick hatches after about a month and is covered with an insulating coat of downy feathers. The parents continue to brood the chick to keep it warm as long as it stays at the colony. One parent always stays with the chick while the other brings it food, usually fish weighing from 5 to 20 g, which it may gather by flying to feeding areas as far as 100 km from the colony. Within three weeks, the chick grows from about 70 g at hatching to about 250 g, or a quarter of the adult weight. 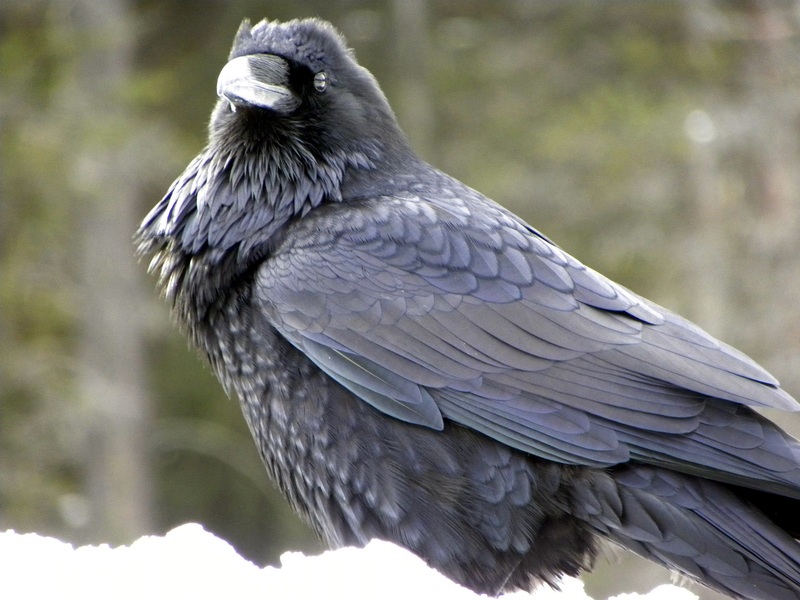 At the same time, it acquires a set of waterproof feathers to replace the down coat. At three weeks, the chick tests its wings as it prepares to leave the colony with the male parent. 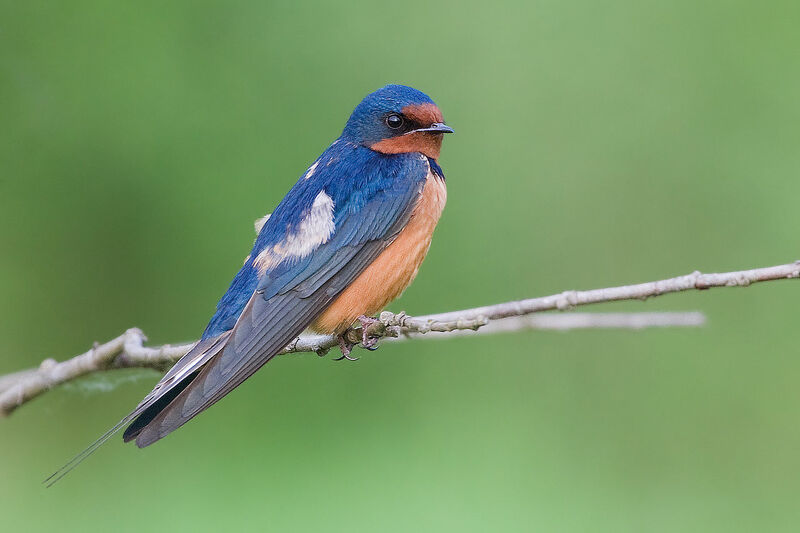 At this age, it does not have proper flight feathers, just short, stubby wings that are not large enough to enable it to actually take off. In colonies on high cliffs, some of them more than 500 m high, the chick hurls itself from its ledge and glides steeply down to the sea, closely followed by its parent. At breeding colonies on low islands, the chick and adult scramble on foot down to the water. They set out on the chick’s first foray from the breeding colony in the late evening, so that by dawn they can be as far as possible from the colony, where the chick could be eaten by gulls. 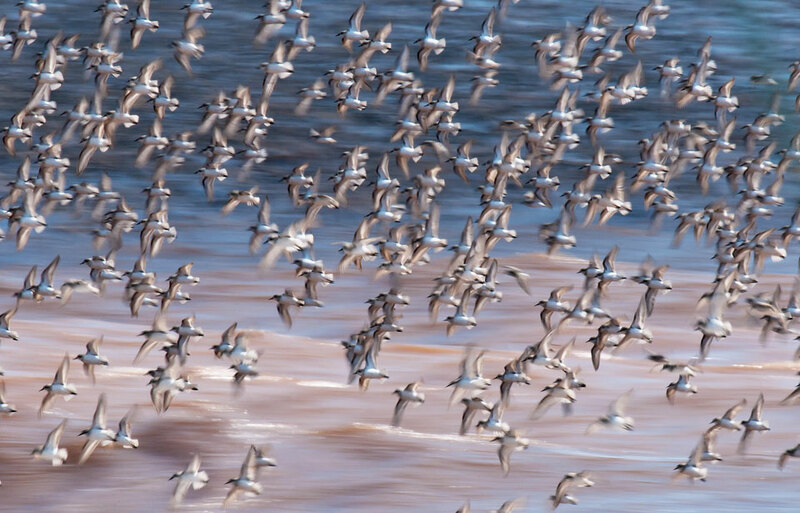 They then begin their migration together. 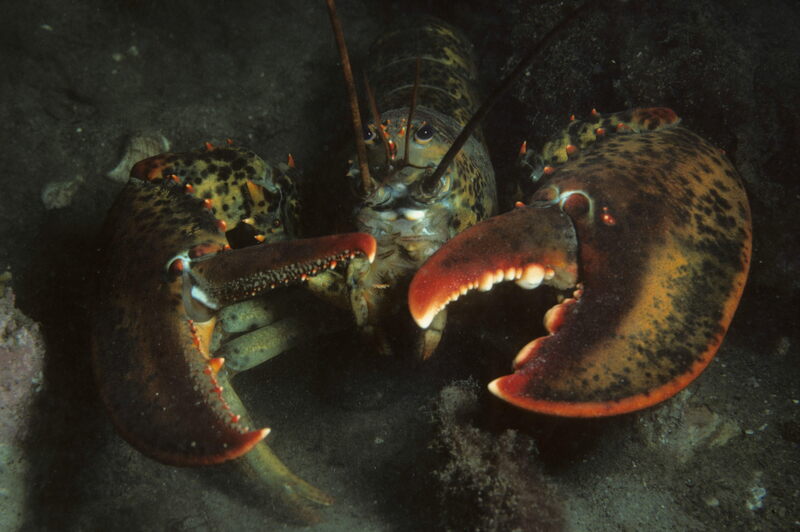 The female leaves the colony alone soon afterwards. 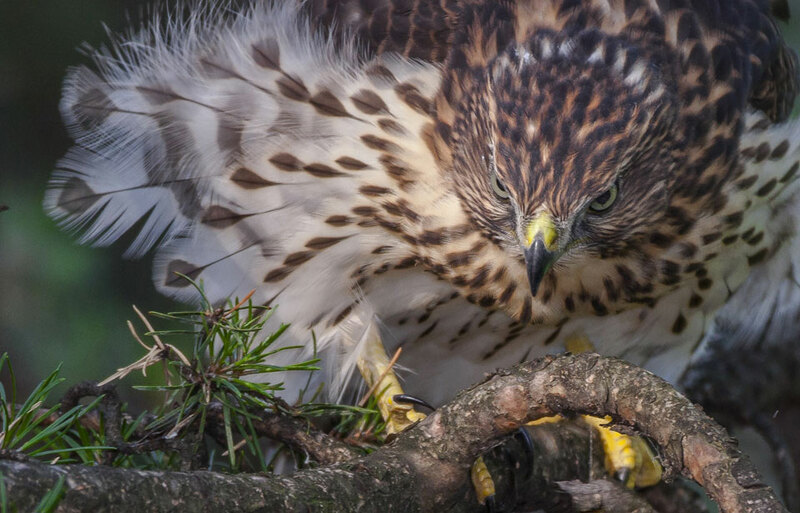 The chick stays with the adult until it is full-grown and able to fly and feed itself, likely at about two months of age. 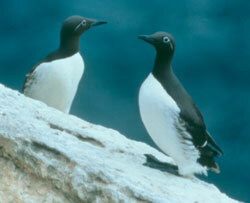 The two murre species are among the most numerous seabirds of the northern hemisphere. A little over one million Common Murres and about three million Thick-billed Murres breed in Canada, making up about 7 percent and 16 percent of the world populations, respectively. The number of Common Murres seems to have risen dramatically over the past 50 years. While the number of breeding Thick-billed Murres in Canada may have declined in the 1960s and 1970s, it seems to be stable or increasing at present. However, some colonies in west Greenland were completely wiped out by hunting in the twentieth century, and no recovery is apparent. Human activities affect murres. 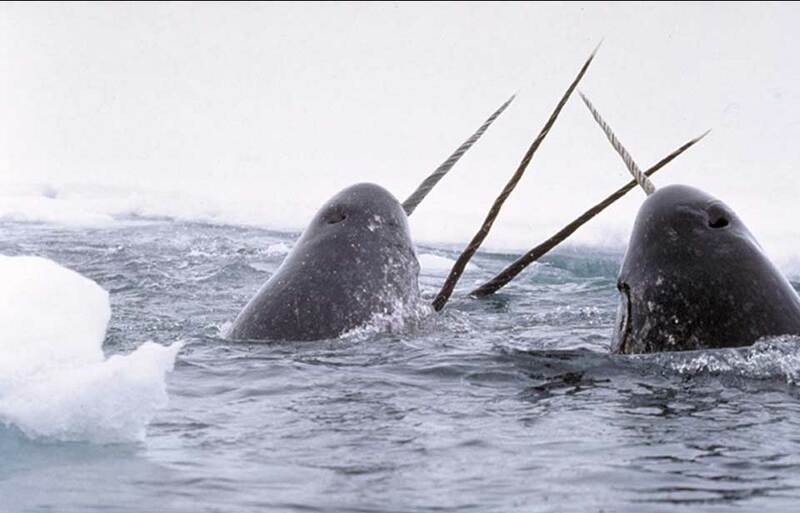 Some are hunted as they migrate off the coast of Greenland, and native people in Canada shoot a few thousand near the breeding colonies in a traditional food hunt each year. The biggest murre hunt occurs off Newfoundland and Labrador, where about 200 000 murres, mainly Thick-billed, are shot each winter in the traditional “turr hunt.” This number, which can be sustained by the murre populations, is a reduction from a peak of over half a million birds in the early 1980s and is a result of the imposition of tighter hunting regulations, beginning in 1993. The regulations were introduced in response to changes in hunting equipment. The use of such items as semi-automatic shotguns and powerful fibreglass speedboats that could travel almost as fast as murres can fly had made the birds more vulnerable to hunters. These seabirds can live a very long time—up to about 25 years—but many fall victim to legal hunting when quite young, often in their first winter. 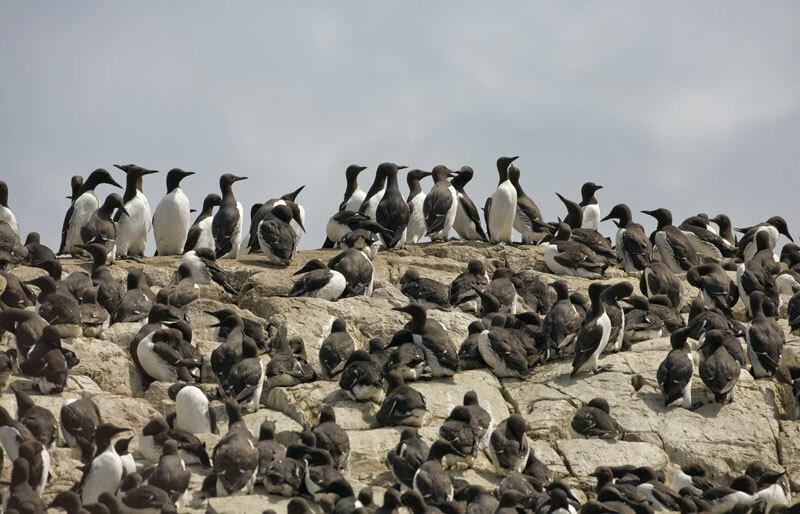 About half of the murres that are shot are only four to eight months old; it is impossible to distinguish young birds from older ones at a distance. Murres are also very susceptible to contamination by oil floating on the sea, because they spend so much time on the surface of the ocean. Surveys by the Canadian Wildlife Service in southeastern Newfoundland and Labrador have found that an average of 70 percent of all murres found dead on beaches in winter have oil, mainly heavy bunker fuel oil, matting their feathers. Recent estimates suggest that in some years, up to 200 000 Thick-billed and 30 000 Common Murres may die from oil pollution in the waters of Atlantic Canada. Off Canada’s Pacific coast, smaller numbers of Common Murres die each year, mainly from oil pollution and being caught accidentally in fishing nets. Although the types of fish that are available in the northwest Atlantic have changed since the 1970s, murres are still able to find ample food in winter by switching between different food sources. Most of the major murre colonies in Canada are now protected as federal or provincial wildlife sanctuaries, where access is limited to researchers and wildlife managers who study these birds and monitor the health of their populations. However, there are several places in Canada where people can watch murres without disturbing them. Large colonies can be seen from the dramatic cliffs at Cape St. Mary’s on the Avalon Peninsula of southeastern Newfoundland and Labrador, from tour boats at Witless Bay just south of St. John’s, Newfoundland and Labrador, and at Bonaventure Island on the Gaspé Peninsula in Quebec. Murres can also be seen at sea, from ferries and coastal boats around Newfoundland and Labrador, and in the sheltered waters between Vancouver Island and the mainland of British Columbia and Washington. 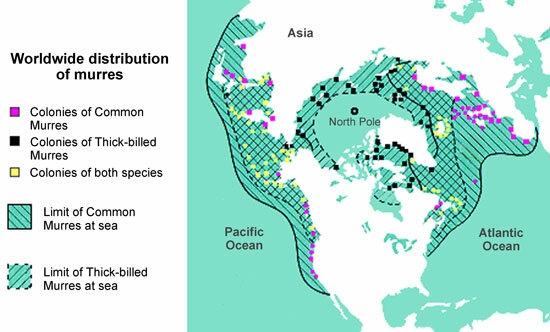 Canada and other Arctic countries now have murre conservation plans. 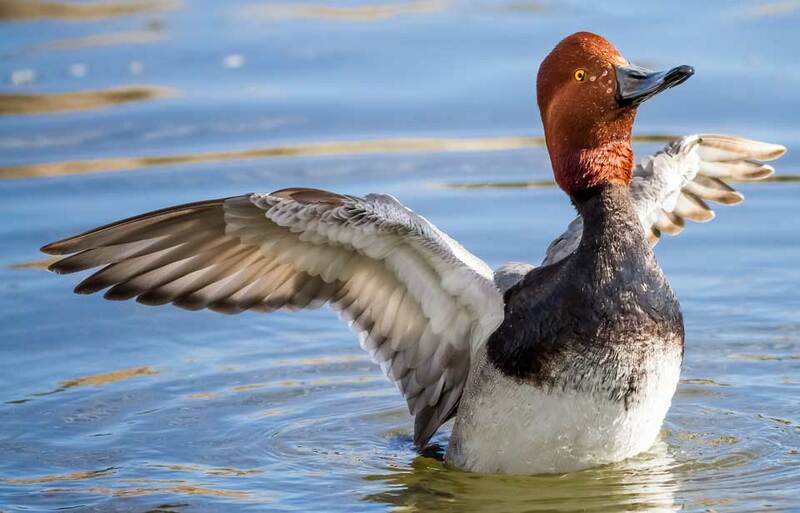 If all of us—hunters, bird-watchers, fishermen, and tourists—act responsibly and recognize the effects that our actions may have, we can help these fascinating birds to remain a familiar part of our Canadian seascape. Brown, R. G. B. 1986. Revised atlas of eastern Canadian seabirds. Volume 1. Shipboard surveys. Canadian Wildlife Service, Ottawa. Brown, R. G. B., and Lock, T. 2003. Oil pollution and birds. Hinterland Who’s Who. Canadian Wildlife Service, Ottawa. Brown, R. G. B., D. N. Nettleship, P. Germain, C. E. Tull, and T. Davis. 1975. Atlas of eastern Canadian seabirds. Canadian Wildlife Service, Ottawa. Freuchen, P., and F. Salomonsen. 1958. The arctic year. G. P. Putnam and Sons, New York. Gaston, A. J., and J. M. Hipfner. 2000. The Thick-billed Murre (Uria lomvia). In The Birds of North America, no. 497. A. Poole and F. Gill, editors. Academy of Natural Sciences, Philadelphia, and The American Ornithologists’ Union, Washington, D.C.
Gaston, A. J., and I. L. Jones. 1984. 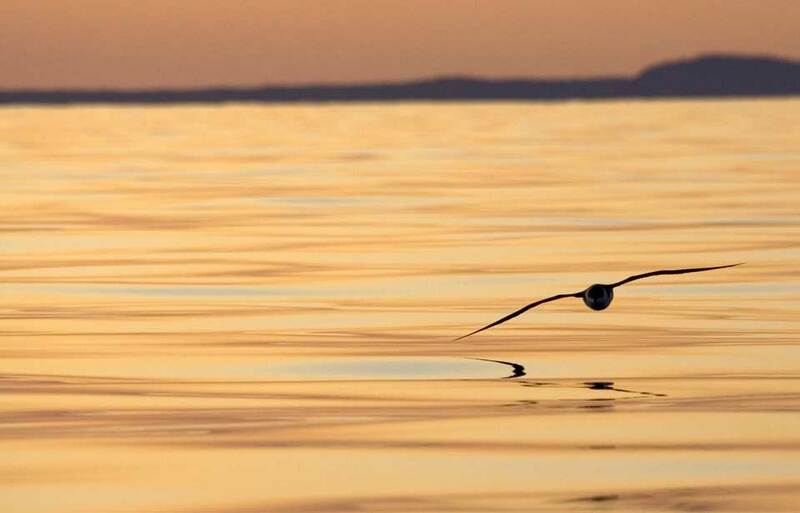 Guide to the seabirds of eastern Canada. 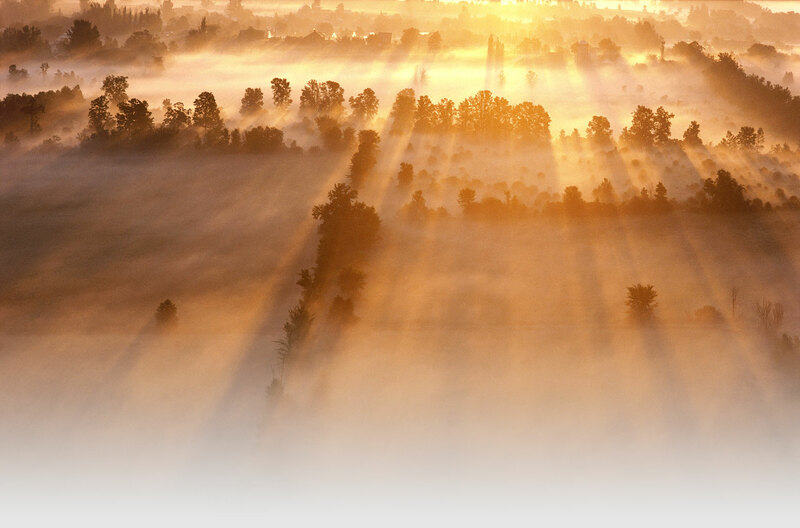 Canadian Wildlife Service, Ottawa. Gaston, A. J., and I. L. Jones. 1998. The Auks: Alcidae. Oxford University Press, Toronto. Gaston, A. J., and D. N. Nettleship. 1981. The Thick-billed Murres of Prince Leopold Island. Monograph No. 6. Canadian Wildlife Service, Ottawa. Nettleship, D. N., and T. R. Birkhead. 1985. The Atlantic Alcidae. Academic Press, Orlando. Tuck, L. M. 1961. The murres. Monograph No. 1. Canadian Wildlife Service, Ottawa. © Her Majesty the Queen in Right of Canada, represented by the Minister of the Environment, 1989, 2003, 2005. All rights reserved.